The wide range of scientific interests and knowledge possessed by 19th-century American physicist Joseph Henry made him well suited to serve as the Smithsonian's first Secretary . In 1846, Henry was appointed to carry out the mission of this then fledgling institution, established with funds bequeathed to the United States by British scientist James Smithson "for the increase and diffusion of knowledge." Henry's first major scientific undertaking was to establish a network of observers throughout the United States for providing the Smithsonian with meteorological data. 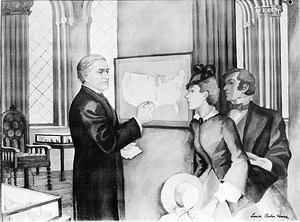 Joseph Henry's special interest in earthquakes went back to his days as a professor at the Albany Academy, where he compiled reports of statewide meteorological observations for the University of the State of New York.2 As Secretary of the Smithsonian, Henry encouraged leaders of scientific expeditions and government officials stationed abroad to record their observations of earthquakes and other natural events. In an 1849 letter to Ephraim George Squier, who had recently been appointed chargé d'affaires to Guatemala, Henry suggested that the intensity of an earthquake, and the direction from which it originated, could be measured by observing the stain left on a bowl of molasses. In April 1850, Henry sent a list of "Observations in relation to Earthquakes,"3 developed for him by geologist John Lord Hayes, to astronomer James Melville Gilliss. As the leader of an expedition to South America, Gilliss had arrived in Santiago, Chile, several months earlier, and had already reported four earthquakes. A seismometer ordered by Henry from Scottish geologist James David Forbes, was in place for the last of the four, but failed to record any activity.4 In his letter to Gilliss,5 Henry suggested that "perhaps a pane of glass place[d] on the top of a post and strewed with sand" would indicate the direction of the minor tremors Gillis had been experiencing, and that the seismometer might work for larger earthquakes. Several days after an earthquake shook Washington, DC, in 1852, Henry developed his own list of questions for members of the Smithsonian’s network of weather observers living in range of the quake. A slightly expanded version of this circular was printed in 1855 . Henry believed the answers to these questions would help determine the geographical origin and intensity of earthquakes. In response to the questions Henry distributed in 1852, Lewis F. Steiner of Frederick, Maryland, penned a letter describing the observations of a friend who experienced the earthquake. "Mr. F. regrets that he could not observe 'the attendant phenomena, with as much care as he desired in consequence of the great alarm of the ladies who were in the room with him.' He compares the vertical movement, 'to that produced by riding rapidly over a suspension or common wooden bridge where the string pieces are long, and the piers distant from each other;' and the horizontal, 'to that of a ship on the ocean.' The sound accompanying the shock, he compares to that 'heard over a rail-road tunnel during the passage of a train of cars through it.'" 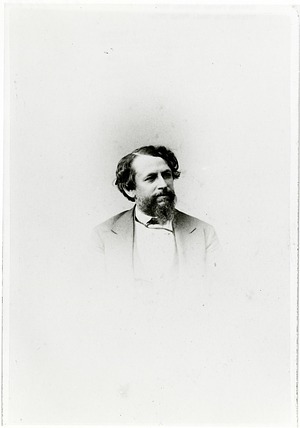 Henry theorized that earthquakes were linked to volcanoes. 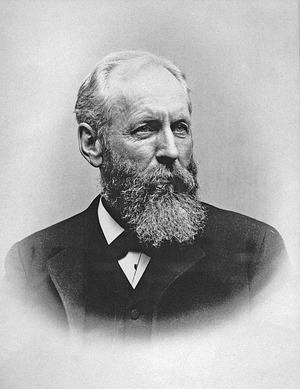 His belief that volcanic eruptions likely resulted from pressure on "molten mass" forced into "caverns in the interior of mountain chains"7 was undoubtedly influenced by his relationship with geologist Henry Darwin Rogers. Rogers sent Henry this sketch, illustrating the progressive power of a lava flow, in 1843. In 1869, Henry wrote to engineer Barton Alexander, stationed in California, to advise him on the construction of buildings that could withstand San Francisco’s earthquakes. Here Henry outlined the theory he shared with geologists of the time that earthquakes were the result of sudden breaks, uplifts, or depressions of the earth's crust. 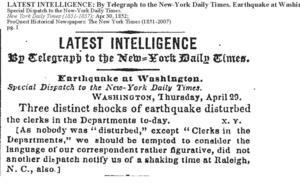 It was not until 1883 that geologist Grove Karl Gilbert argued earthquakes were caused by movement along faults.8 Henry's attempts to systematically track and study earthquakes in the United States provided a baseline of data for later scientists to consult in their own research. "Ocean Portal: Earthquakes Resources," National Museum of Natural History, 2010. Courtney Esposito, "All Shook Up: A History of Earthquakes at the Smithsonian," The Bigger Picture (blog), Smithsonian Institution Archives, September 21, 2011.